Fresh juices and smoothies make a nutritious snack or breakfast, helping you meet your daily fruit recommendation, between 1.5 to 2 cups per day, as set by the U.S. Department of Agriculture. Blending fruits does not significantly change their nutritional value unless you store the blended drink for an extended period. According to Fruit and Veggies More Matters, blending fruits primarily changes their texture and appearance, making them spoonable or drinkable, and does not cause them to lose any nutrients. However, limiting the storage time of your blended fruits will help preserve their nutrients, as longer storage times leads to nutrient degradation. A 2006 issue of the "Journal of Agricultural and Food Chemistry" found that between 5 to 25 percent of vitamin C content was lost in cut pieces of kiwi, pineapple, mango, strawberry, watermelon and cantaloupe over a period of six days when the fruits were stored at 41 degrees Fahrenheit. There was also a significant loss of carotenoids. For optimal nutrient levels, don't cook or overblend your fruit as some nutrients are heat-sensitive and could potentially be destroyed. Blending your fruits for only a short period of time can also help reduce lost nutrients, as long blending periods sometimes cause heating in the blender. Heat-sensitive nutrients include pantothenic acid and vitamin C, and sometimes vitamin A, although it is relatively stable when exposed to heat. Thiamine and folate are also sensitive to heat, but only when exposed to high temperatures, for example, during cooking. To further keep any nutrients from being lost in your blended fruit preparation, avoid washing cut or peeled pieces of fruit in water, and do not soak the cut pieces in water unless you are planning on blending the soaking liquid with the fruits. The B vitamins and vitamin C are all water-soluble. This means that the vitamins will leach out of the fruit when it is exposed to water, potentially reducing the overall nutritional value of your blended fruit. When fruits are juiced, their insoluble and some of their soluble fiber is extracted and thrown away. 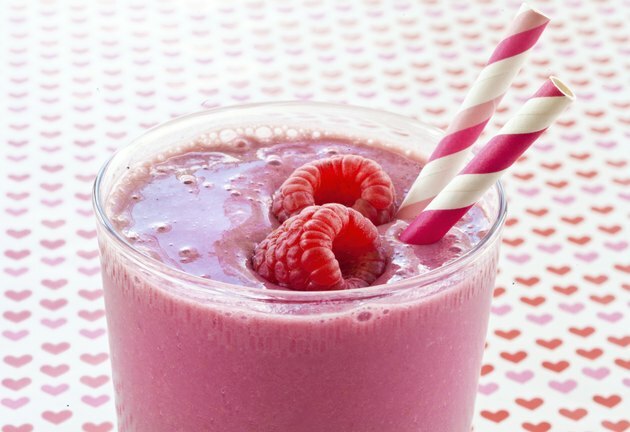 However, blended fruits keep all of their dietary fiber content. A diet high in dietary fiber can help lower cholesterol levels, as well as reduce the risk of diabetes and heart disease. It also helps relieve the symptoms of constipation and diverticulosis. Another benefit of blending over juicing your fruits is that many homes already have a blender for making small batches of fresh juice or smoothies, so the sometimes expensive purchase of another piece of kitchen equipment isn't necessary. Fruit and Veggies More Matters: Does Blending Affect the Nutritional Value? Extension: How Long Do Fruits and Vegetables Retain Their Nutritients?